For anyone growing up in the 1970s there were several TV series that could be described as "essential viewing", but none were more deserving of that accolade than The Six Million Dollar Man, the TV series that mixed Bond-ian espionage action with sci-fi adventure and, along the way, became a pop culture institution. 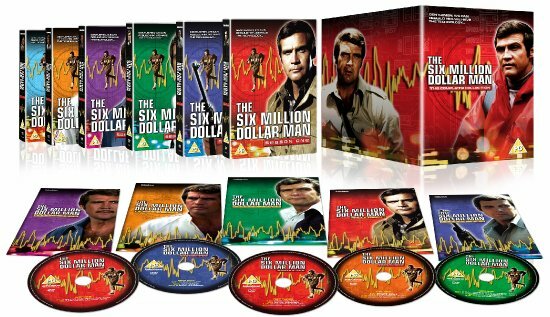 Now, The Six Million Dollar Man: The Complete Collection is coming to DVD as a 40-disc set, featuring every episode from each of the show's five seasons, plus the three original TV movies that started it all, along with the three further TV movies that followed in the late 1980s and early 90s. Additionally, this edition includes extensive stills galleries and episode guide booklets exclusive to the UK release, making this the world's most definitive Six Million Dollar Man DVD collection. Based on the novel "Cyborg" by Martin Caidin, and pre-dating the similarly cyborg-themed "The Terminator" and "Robocop" franchises by over a decade, The Six Million Dollar Man was one of the most popular and successful TV series of its era, propelling Lee Majors (already relatively well-known as a series regular in the Western series "The Big Valley" and "The Virginian") into the realms of superstardom, becoming a merchandisers' dream and spawning an equally successful spin-off series in "The Bionic Woman". Majors stars as Colonel Steve Austin, a former astronaut who is seriously injured when the jet he is flying crashes. A man barely alive, Austin is "rebuilt" with bionic parts replacing his right arm, both legs and his left eye, enhancing his strength, speed and vision far beyond normal human capabilities. Following his recovery, he goes to work for the covert Office of Scientific Intelligence as a secret agent, where his regular missions involve not only bringing international criminals to justice but also investigating downed UFOs and taking on killer female androids and even the mythical creature, Bigfoot! Co-starring Richard Anderson (The Fugitive; Perry Mason) as Austin's supervisor Oscar Goldman and Martin E. Brooks (Dallas; McMillan & Wife) as scientist Dr. Rudy Wells, the series also features a host of guest stars including Lindsay Wagner, Farrah Fawcett-Majors, Kim Basinger, Martine Beswick, Sonny Bono, Louis Gossett, Jr., Erik Estrada, Stefanie Powers, John Saxon, William Shatner, George Takei, George Foreman, Donna Mills and Andre the Giant, amongst many others. The 40-disc The Six Million Dollar Man: The Complete Collection (cert. PG) will be released on DVD (£199.99) by Fabulous Films on 26th March 2012. 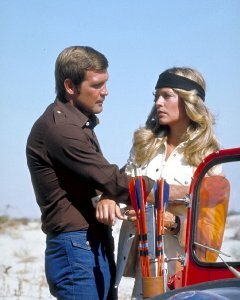 Special Features include: exclusive new interviews with Lee Majors and Lindsay Wagner; all three pilot movies of The Six Million Dollar Man; all three reunion movies of The Six Million Dollar Man; all crossover episodes of The Bionic Woman; 17 exclusive featurettes; audio commentaries; UK exclusive stills galleries; UK exclusive episode guide booklets.